On Thursday, Razer revealed the Razer BlackWidow Ultimate 2016, a new mechanical keyboard that offers improved controls over lighting along with an included two-year warranty. It also features Razer’s own proprietary mechanical switches, which, the company claims, are the “first and only” designed specifically for gaming. The lighting in the Razer BlackWidow Ultimate apparently borrows from the company’s Chroma tech, which normally boasts a color palette of 16.8 million, though it seems like this keyboard in particular will be limited to green backlit LEDs. However, there are a “range of unique” effects that can be enable in the accompanying Synapse software. Included by default are Wave, Ripple, Reactive, and Starlight, among others. More interesting, though, is that players can create their own lighting animations on the keyboard using the embedded effects configurator in Razer Synapse. Depicted in the video below are a few possible outcomes of this configurator, as conceived by Razer itself. The new and presumably improved Razer BlackWidow Ultimate not only prevents smudges with its included top-cover, but it also exhibits a combined audio and microphone jack, a USB pass-through port to keep your cables organized, and a revised indicator panel resting on the top right. Every switch on the BlackWidow Ultimate, Razer says, comes with both actuation and reset points optimized to “a fraction of a millimeter,” designed for improved response times. The 2016 edition of the BlackWidow Ultimate can allegedly handle up to 60 million keystrokes, making for a considerably extensive lifespan. The Razer BlackWidow Ultimate 2016 will retail for $110 when it releases today in North and Latin America, and later this year in both Asia and Europe. Regardless of where you’re located, you can expect Razer’s new mechanical keyboard to come bundled with a two-year warranty, a braided fiber cable, and keys with dynamic lighting, 1,000Hz Ultrapolling , and an actuation force of 50g. 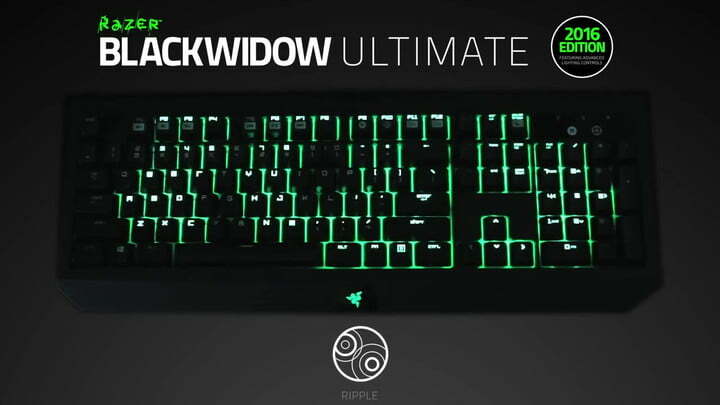 Additional information about the BlackWidow Ultimate 2016 can be found on Razer’s website.